Description: The actual flowers are enclosed by woolly-haired, mostly scarlet red, petal-like bracts that are deeply cleft into 3 round-tipped lobes. The beaklike corolla is tubular, 1 1/2 inches (3.8 cm) long, well-exserted, green on the top side, and red on the bottom side. The flowers are followed by egg-shaped seed capsules. The leaves are green, alternate, and densely covered with matted, flattened, white-woolly hairs on both sides. The lower leaves are entire and linear, while the upper leaves intergrade with the floral bracts and are deeply pinnately cleft and have 2 narrower, divergent side lobes. The stems are densely covered with matted, semi-appressed, white-woolly hairs. The plants are partial root parasites of nearby plants. 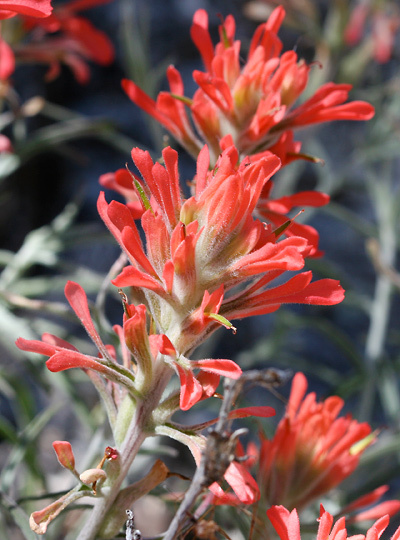 While this plant can be found growing in the desert, all of the other red-flowered Castilleja species found here prefer higher elevations. 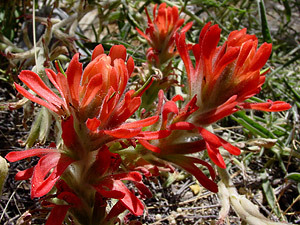 The similar Rincon Mountain Indian Paintbrush (Castilleja austromontana), Wholeleaf Indian Paintbrush (C. integra), Lesser Indian Paintbrush (C. minor), Trans-Pecos Indian Paintbrush (C. nervata), and Santa Catalina Indian Paintbrush (C. tenuiflora) do not have deeply cleft floral bracts or deeply cleft upper leaves. 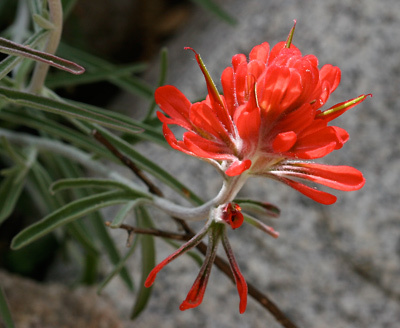 Wyoming Indian Paintbrush (C. linariifolia) does have deeply cleft floral bracts, but they have much narrower, point-tipped lobes. 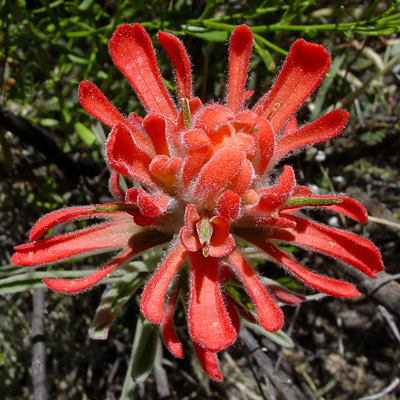 Huachuca Mountain Indian Paintbrush (C. patriotica) is only found growing here in the Chiricahua and Huachuca Mountains and has deeply divided leaves with often 4 wide-spreading side lobes.